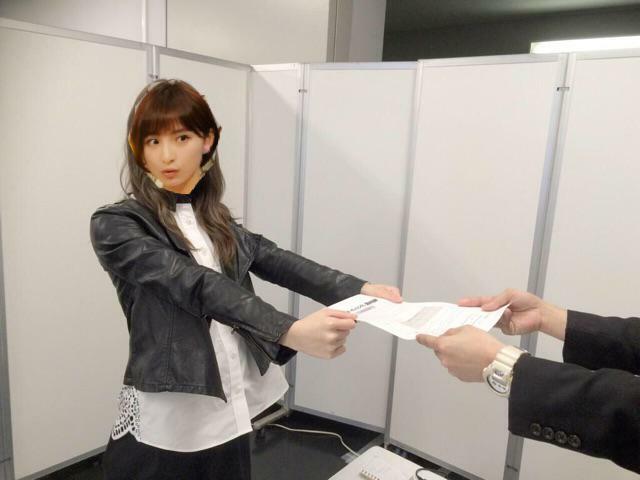 On March 19, it was announced that the 7th AKB48 Senbatsu General Election would be held at Fukuoka Yafuoku! Dome on June 6. 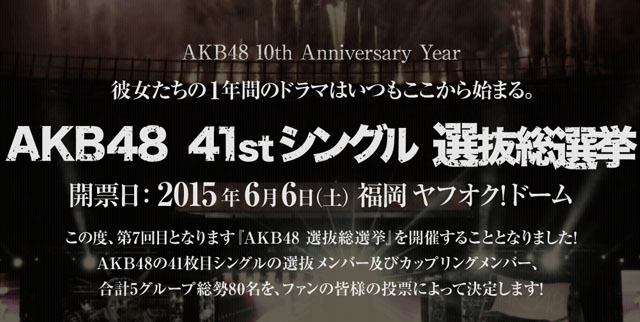 As many of you know already, this is AKB48 group's annual big event. Just like last year, the election will be held in the candidacy system, and the members of AKB48, SKE48, NMB48, HKT48, and former AKB48 members who transferred to its overseas sister group (Nakagawa Haruka and Chikano Rina) are eligible to stand as a candidate. The reception desk period for the candidacy will be during March 25 at 4:00 pm ~ March 29 at 10:00 pm, and The voting for the election will begin on May 19 at 10:00 am until June 5 at 3:00 pm (JST). A prompt report will be revealed at AKB48 theater (Akihabara, Tokyo) on May 20th, and the final results will be announced at the vote counting event at Fukuoka Yafuoku! Dome on June 6. The voting rights will go to those who purchase AKB48's upcoming 40th single (to be released on May 20, currently untitled), each group's fan club members, mobile members, and so on. Hoping for big changes at the top, least of which is Milky back in Senbatsu. 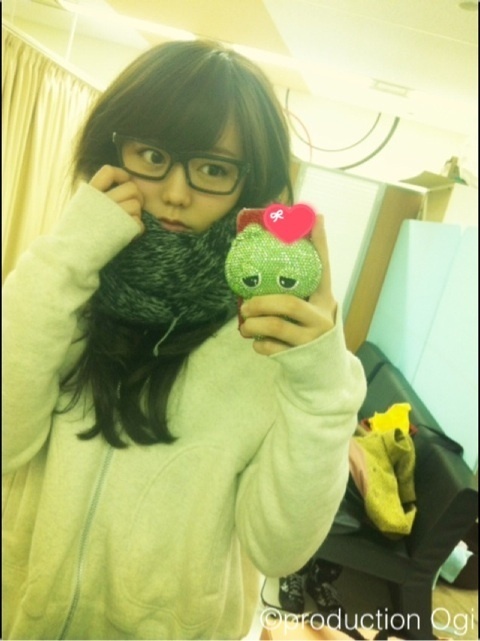 Also hoping for the hotties in UG to move up and 3-4 not so's to get out of Senbatsu. Watched 2014 Single Selection DVD today and I just can't believe how few of 300+ are featured video-wise. I want yukirin on the top! She must be coming with an announcement soon to declare that and I think with only a few 1st generation members left it could be time to continue on (just a thought) although with Aya and Dasu, they could pick up with Jurina maybe shooting for the top over Sayanee. no big deal for her because she was purely on JKT until she probably would be forced to come back. 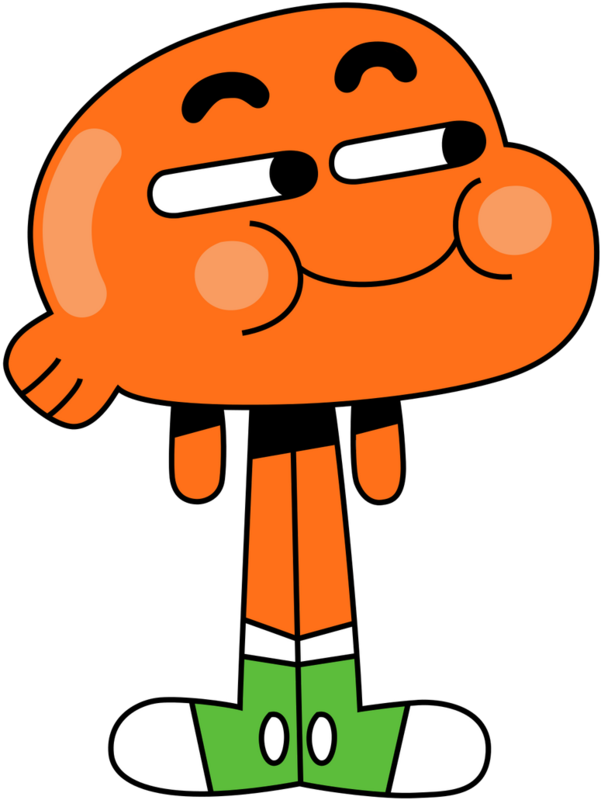 It's good for her because she can get accustomed to everything there and maybe spread the wealth. Mariko just signed up for this year's sousenkyo!!!! I'm sad Rena isn't participating. I <3 her. So, the candidacy nomination period for this year's election has now ended. There's a listing of all the members who are in for this year's election on the main website HERE. According to the NEWS page on the website, Sayanee was the final member to submit her candidacy before they closed up and stopped accepting applications. LULZ, assuming that she didn't just use some program on her phone (or assuming she just cannot do it that well), Mariko did a terrible job of photoshopping her face onto the the pic of Mariyagi submitting her candicacy. Watch now people are going to start commenting on the fact that her name is not included in that list of submitted candidates in the link that I previously posted. Wouldn't surprise me if people start publicly wondering if she was serious about entering or if she's just trolling the fandom.